Bored of social networks newsfeed? Tired of politics? Let’s create it yourself in Kingstagram! Choose one of 190 real countries of modern world and start conquering the Earth … from the first like. 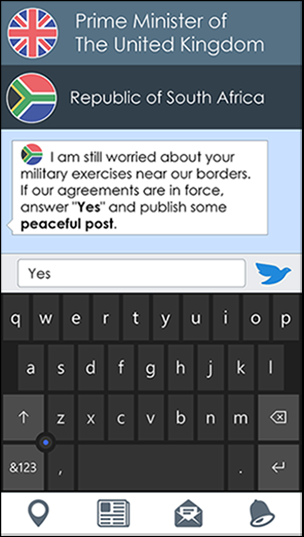 Kingstagram is the deceptively simple geopolitical simulator in the familiar format of social network. Create tons of fake news, share them to other kings and presidents, collect likes and declare wars to everyone who dared to dislike your post! Inside the elite social network every action will have great consequences for the whole world: you will win wars and strengthen alliances, conquer countries by reposts and weave intrigues in private messages. Hurry up - there is one more thumb up before the world is yours! We have no idea why you guys still don't know what are we making days and nights. So, let's get to know each other. 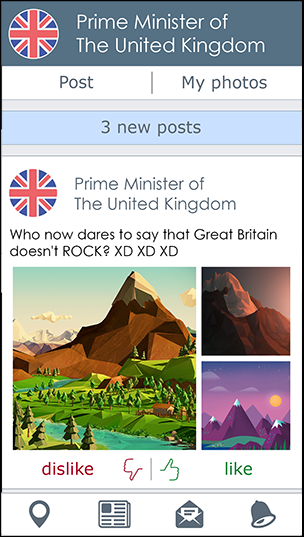 We are the development team of Kingstagram, funny geopolitical simulator for mobile platforms and PC. Q. So, Kingstagram, you say. What is it actually? A. Kingstagram is an indie game we have started to create few months ago. It looks like usual social network like Facebook or LinkedIn, but, to be honest, could you remember one social network where you can conquer the world? There's one. Right here. Kingstagram. Q. Conquer the world? How exactly? A. By your social activities. 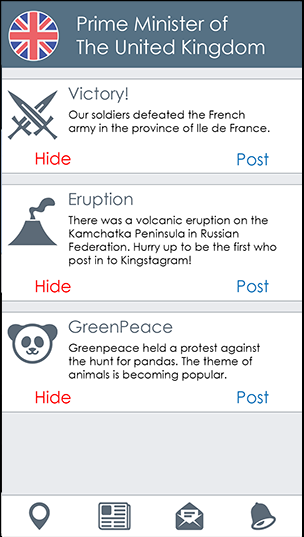 As in Facebook, in Kingstagram you can post news, like and comment other posts, gain subscribers. But the first thing you do in Kingstagram is choosing the country you want to rule. 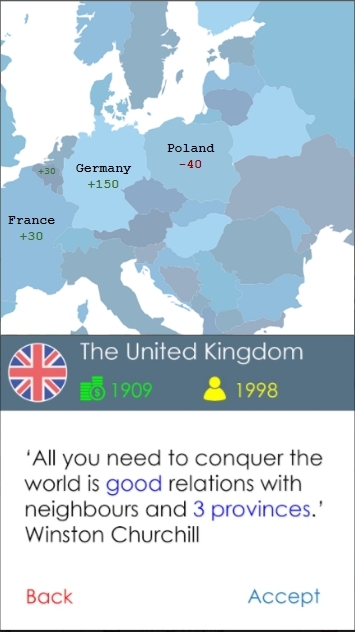 And then you have to manage relations with your neighbours, make friends and gain enemies, increase your war power (those subscribers), and take part in wars in order to make other countries part of your great empire! Q. Does it mean that Kingstagram is an online game? A. Actually, we aren't sure yet. The very first version of the game will be more like Plague Inc or (sounds crazy!) modern and casual version of Victoria II (or Europa Universalis). Short sessions, very high variability, many decisions with consequences and ways to achieve the goal. We guarantee that you won't even notice if other world leaders are real people or advanced (!!!) AI. Q. Okay, and who are you guys? A. Just three game developers from Russia with 3 to 6 years of experience in making all kinds of videogames. Few months ago we decided to make something that can provide you the new type of gameplay. Something that you haven't seen before. We'll see. Q. Sounds great. Do you need some help? A. We're in Russia, man. Of course, we need help! Well, seriously. First, we need UI designer and 2D Artist to make our Alpha version well-looking. So we could share it and get some feedback from our first players. Second, we need investment because Kingstagram is what we really want to get finished and published. If you have any questions or would like to speak about it, please leave a message at kingstagram.game@gmail.com. Thank you! Q. Hmm.. Almost ready to give you money! I just need some more information about Kingstagram. Do you have any? A. Yes we are! Please take a look at our PRESENTATION! And again: write us to kingstagram.game@gmail.com and subscribe us on Facebook and Twitter! We definitely try to make Kinstagram as good and interesting as we can! Your feedback and support are the most importants things for us! It helps us to find ways to get the game done soon! Thank you! We're gonna do everything to get Kingstagram released asap. If you'd like to help, please review us on YUNOIA (yunoia.com/b/kingstagram)! The more positive reviews, the more chances for us to find some funding! sure! thanks for your review;) it's very important for us to know that we do right thing! you can also follow us on Twitter or FB to get the latest news about Kingstagram.